Kaylee Ferguson, a junior biology major, and Jared Fernandez, a second year master’s in biomedicine graduate student, took top honors at Eastern Mennonite University’s Annual STEM Student Research Symposium. Their research was part of a grant-funded project to study hypertension. Eight presentations were made by 14 biology, chemistry, environmental sustainability, computer science and mathematical sciences students that showcased the breadth and depth of research opportunities available at EMU. The evaluation – led by Linette Watkins, professor of chemistry at James Madison University – included three criteria: collection of data, thoroughness of research design and analysis, and clarity and accessibility of the oral presentation. Second place was awarded to junior Hannah Daley for her presentation about her National Science Foundation-sponsored research, in partnership with two professors at James Madison University, on the effects of caffeine on athletes. 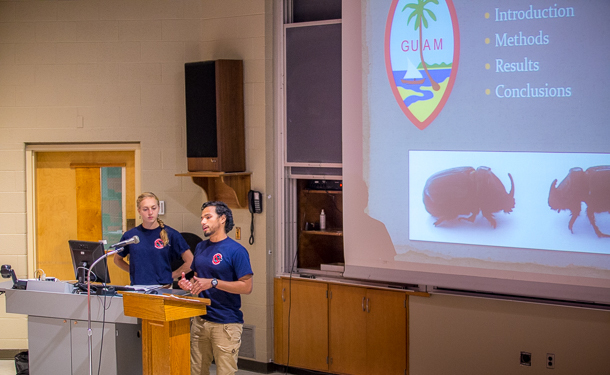 Sophomore Kat Lehman and junior Diego Barahona were awarded third place for their research on utilizing radio-tracking to locate coconut rhinoceros beetles’ breeding sites, which was conducted under the direction of chemistry professor Matt Siderhurst in Guam. Siderhurst has worked for several years on research projects involving the development of attractants for invasive and agriculturally important pests. Research projects often pair students with professors engaged in long-term studies. The competition winners, Ferguson and Fernandez, were research assistants to Professor Julia Halterman, who earned a $100,000 Jeffress Trust grant to study a multi-year investigation into the causes of hypertension. In Ferguson and Fernandez’s project, rats were fed a high fructose, high salt, low salt, and no salt diet and measured the activation of genes involved in disease. The STEM symposium is also offers students like Hannah Daley and Janaya Sachs, who both earned grants to engage research opportunities off campus, to share what they’ve learned. Sachs explored a new ligand for synthesizing copper, a summer project she engaged in through the National Science Foundation Research Experience for Undergraduates. She worked at the Tolman Lab at the University of Minnesota. The bioorganic copper project is just one of several research opportunities she’s been involved in. Her freshman year, she joined organic blueberry research, led by Roman Miller, director of the MA in biomedicine program, and supported by a grant from the U.S. Department of Agriculture. She and Hannah Daley are both currently involved in evaluating the effects of hydrofracking on stream and well water, a project under the direction of Doug Graber Neufeld and Kishbaugh. Among the research shared, a unique transdisciplinary project was conducted by biology major Samuel Miller and computer science major Alex Bender, advised by Siderhurst and computer science professor Dee Weikle. Miller conducted a chemistry project that involved identification and quantification of volatiles released by the noni fruit during ripening that provided a complex data set that was difficult to analyze. Bender and Miller have both used a mathematical technique called Principal Component Analysis to analyze the results in a simpler manner. Bender is documenting their methodology for PCA usage, simultaneously evaluating software programs Cluster 3.0 and SPSS for their ability to simplify the data set. Professor Jeff Copeland, who teaches courses in genetics, cell biology, microbiology and immunology, advised several research projects. Biology major Chris Miller researched the effect of anthocyanins, richly concentrated plant colorants that may have protective effects, on mouse fetal development when the mice are exposed to a significant amount of alcohol. Derek Harnish and Eli Wenger presented their research on the neuronal basis of aging in flies. Harnish, a biology major, and Wenger, a biology and biochemistry double major, worked with Copeland on his ongoing project to identify specific types of that have the potential to extend lifespan in flies when the mitochrondrial electron transport chain is disrupted. Biology majors Viktor Kaltenstein and Seth Suttles teamed up to study mold growth in a vacated section of the Suter Science Center campus using the Environmental Relative Moldiness Index (ERMI).